The Ganga is the third largest river in the world. It also one of the most polluted. This 2,500 km-long ‘goddess’ is truly the lifeline of India, with over 500 million people depending on it for their day-to-day livelihood. It also happens to be the primary source of politics and victory for the most powerful person in our country today, Prime Minister Narendra Modi. Visuals of Modi doing Shramdaan at Asi Ghat in Varanasi during 2014 elections was perhaps one of the strongest election optics of his campaign, helping him smoothly migrate from Gujarat to central politics. And so was perhaps his first announcement as the Prime Minister – the allocation of approximately Rs 20,000 crores for the Namami Gange programme. It would be unfair to attribute all the grief and muck of the river to the current political dispensation. An ambitious ‘Ganga Action Plan’ was announced in year 1986 by the then prime minister Rajiv Gandhi. Since then, several successive governments have claimed to clean the river in some form or the other. It’s been over four decades and over Rs 20,000 crores spent in cleaning the river, but the dark stinking river stands testimony to the effort and will that everyone displayed. A hapless and dead river, announced by a government body National Cancer Registry Programme to be a killer river in 2012. In last three years, the government has allocated over Rs 6,000 crores on cleaning Ganga, but over 70% of it remains unused. Over 144 large drains discharge millions of sewage and industrial waste into the river each day, while the river gently slips towards Bay of Bengal. By his own admission Vijay Goel, the Minister of Water Resources, told the parliament early this week that water in the Ganga is not even fit for bathing at some of the holiest Hindu sites where pilgrims go to wash away their sins and scatter the ashes of their loved ones. Recently, the Uttarakhand High Court pronounced an interesting judgement, granting the ‘Ganga’ and ‘Yamuna’ the status of a legal and living entity. Since then, there has been a certain sense of euphoria and hope in the country vis-à-vis the revival and upkeep of these rivers. No doubt it is a strong and strict observation but to get swayed by this one judgement and hoping that the river will be able to advocate for itself or will be saved by its custodians is highly misplaced. It was illegal to pollute the river earlier and it remains illegal to pollute it even now. One needs to understand that the judgment was pronounced in continuation of a hearing where the court’s previous orders of December 2016 were violated or not observed. At most this could be looked at as an order passed in frustration and anger, no way in celebration. The judicial machinery of this country had pronounced it dead a long time back, most recently the Supreme Court as well as The National Green Tribunal observed that not a single drop of Ganga has been cleaned in these years. Therefore to really hope that the river will suddenly find new set of patrons and saviors, just because it’s a ‘living entity’ proclaimed by the High Court, is a fallacy. Irony also remains that most recently the Supreme Court finally thought in its wisdom, while hearing a PIL filed in year 1986 on Ganga pollution, that perhaps the NGT is the appropriate authority to conduct the hearings. Yes, it’s just been four decades since the highest judicial body has been struggling to fix accountability and rule of law with respect to Ganga and its pollutants. Last week, Uttarakhand HC slammed the Union government as well as the state government for having misplaced priorities like locating the missing River Saraswati but doing “nothing concrete” in cleaning River Ganga. And it has been slamming some agency or the other all these years. Is it not in the interest of the river, this country and the justice system that the violators are brought to book and punished? When will the last warning really be the last warning? Indeed governance falls in the purview of the governments and not the judiciary, and we are thankful that the courts of our country seem to be the only institution showing some spine on critical issues of governance and especially environmental governance. But perhaps even the courts could do more, or perhaps pose less and act more. Even they suffer the new disease of rhetorics. 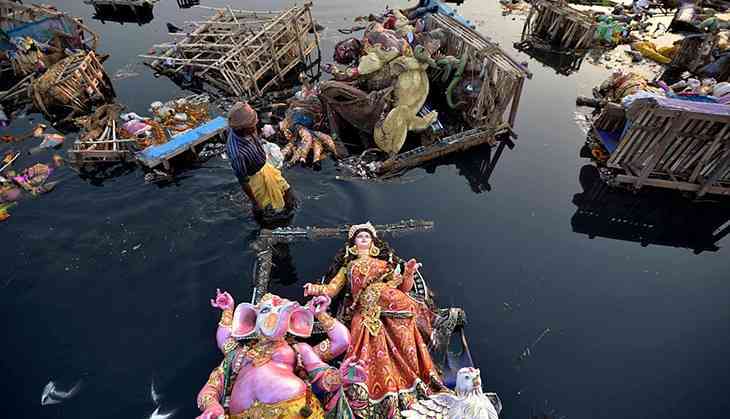 The primary question, however, remains – what will save the Ganga, and Yamuna, and many other rivers of our country? No, its not a mere Ganga Arti or Puja, nor a new badge stating ‘I am Ganga, am a living entity’. It’s only and only right political will and a matching governance infrastructure that can solve the problem. We have known sources of pollution and we need a strict and robust enforcement infrastructure. The sewage treatment plants and the effluent treatment plants have to be constructed on time, polluting industries need to be completely shut down rather than warned, flood plains have to be saved from any temporary or permanent construction be it for the next World Culture Festival by Sri Sri, executive need to be held accountable and punished and penalised for not delivering their duty and many more. Citizens need to understand the urgency of the crisis, its one of the biggest public ecology and public health crisis our country is facing at the moment, for over 40% of the population depends on Ganga for its drinking water. A river is not just water under the bridge, its not just a waterway, its an ecosystem. Saving Ganga is saving yourself. If giving it the status of 'Narendra Modi' will inspire the governments and citizens to spring to some action, let’s call it Ganga Modi today! Ram Mandir dispute: Why is SC suddenly pushing for an out-of-court settlement?